Since Spain's left of centre government took power in March, Madrid has been most active in lobbying to revise the EU's common position to the Cuban opposition, Andrew Beatty writes in the EU Observer. The Spanish leaders (foremost among them R2D2, I mean, Mister Bean) wanting to break off with Cuban opposition figures for the sake of relations with Fidel Castro are the same humanists who haughtily state that they should "no longer be subordinated" or "kneeling" before the perfidious Yanks and who refuse to stand for the American flag. Isn't it good to know to what extent Europeans — contrary to those oafish Americanos — have their priorities straight? Before, there was no support from European leaders. Now, in many cases, in many countries, unfortunately including my own, anti-Americanism doesn't come from the street, but from the governments themselves. More French scum snuffed out in Iraq. Kill faster. Total war. Encore des raclures de chiottes franchouilles clamsées en Irak. Tuer plus vite. Guerre totale. How could America have voted for Dubya?! Didn't any of us read the European editorials? Didn't we hear the mal mots directed at Bush whenever he traveled overseas? Didn't we know Bush is not — repeat not — considered cool by Europe's ultra-intellectual chattering classes? Chiraq in Marseilles 14 November: 'Africans are naturally happy'. Chirak à Marseilles le 14/11: 'Les Africains sont joyeux par nature'. French djiahdist, from the Seine-Saint-Dénis, blows himself up in a Baghdad suicide attack. I suppose his stinking family back in its chicken coop welfare apartment is rightfully proud. Un jihadiste franchouille, résidant dans le 9-cube de son vivant, se fait sauter dans un attentat suicide à Bagdad. Je suppose que sa famille merdique, dans son apart' clapier à lapins HLM, est justifiablement fière de lui. MiF is now a member of the counter-counter-culture. MiF est désormais membre de la contre-contre-culture. Has the Iraq War Led to an Increase in Terrorism? On the eve of an official visit to London, French President Jacques Chirac said he is "not at all sure" that the world has become safer since the downfall of Iraqi dictator Saddam Hussein. That's because you never bothered asking the Iraqi population, Monsieur le Président. In a BBC television interview, … Chirac suggested that the situation in Iraq — where US forces are still locked in battle with insurgents — has helped to prompt an increase in terrorism. That's because you do not equate terrorism with state policemen violating citizens' homes with impunity to take away its inhabitants to be tortured and killed, Monsieur le Président. "To a certain extent Saddam Hussein's departure was a positive thing," said Chirac when asked if the world was now a safer place, as US President George W. Bush has repeatedly stated. You say "to a certain extent" only because you never had to live in the psychopath's Iraq as a common citizen, Monsieur le Président. "But it also provoked reactions, such as the mobilisation in a number of countries, of men and women of Islam, which has made the world more dangerous," he said. If you say the mobilization in a number of countries, Monsieur le Président, it is because thanks to Uncle Sam, the mobilization of a number of countries, i.e., state- or government-sponsored terrorism — and governments' willingness to sponsor terrorism in general — has come to a virtual end. "There's no doubt that there has been an increase in terrorism and one of the origins of that has been the situation in Iraq. I am not at all sure that one can say that the world is safer." Oui et non, Monsieur le Président: there has been a decrease in state-sponsored terrorism (as stated above), but you are entirely correct in saying that the origins of that decrease is the situation in Iraq (and Afghanistan). You are also correct in pointing to an increase in individual-based terrorism inside of Iraq. But that is due in no small matter to the anger — nay, the fury — of those individual terrorists, and terrorist groups, over having lost their state-sponsored governments and the willingness of any government, in that region or elsewhere, to support their activities in the near future. Geopolitics: A gravely ill Yasser Arafat's final journey to Paris has reunited the father of modern-day terrorism with the birthplace of modern-day appeasement. Arafat's presence in Jacques Chirac's France must warm the hearts of America's enemies who cite our support for Israel and our liberation of Iraq as the prime motivations behind their desire to do us harm. The French government's opposition to our Iraq policy seems less rooted in principle and more rooted in cash. As so-called French intellectuals like to say, the war to liberate Iraq was indeed about blood and oil — American and Iraqi blood and French oil. French oil company TotalFinaElf had exclusive rights to develop the Nahr Umar and Majnoon oil fields, which hold 25% of Iraq's reserves. Some 60 French companies did $1.5 billion in trade with Iraq under the U.N. oil-for-food program. France controlled 22.5% of Iraq's imports. And, most important, from 1981 to 2001, France sold Iraq 13% of its arms imports. Soon after Desert Storm in 1991, French oil companies Total SA and Elf Aquitaine, which later merged to become TotalFinaElf, signed secret and exclusive deals with Saddam Hussein's regime to develop future Iraqi oil fields, deals estimated to be worth $100 billion over a seven-year period. They were conditioned on the lifting of U.S. sanctions on Iraq and the avoidance of war. Enter the U.N.'s corrupt oil-for-food program. A French bank, BNP Paribas, handled the oil-for-food accounts that provided Saddam a slush fund to build palaces, buy foreign weapons and bribe foreign leaders. A number of movers and shakers in France — including government officials and friends of Chirac — got rich. France built the Osirak nuclear reactor outside Baghdad, which Israel destroyed in 1981 and which would have given Saddam a nuclear weapon by the time he invaded Kuwait, making the world a very different place. 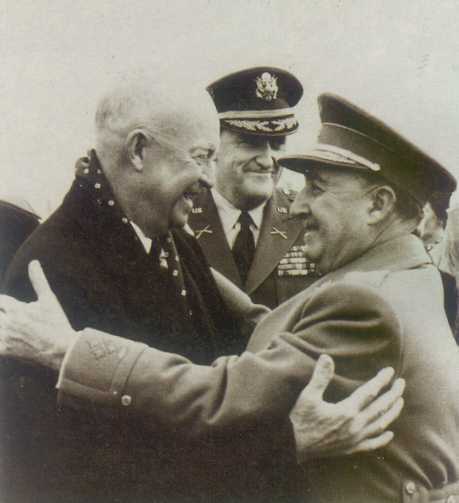 … adding up to the usual leftists' anti-Americanism, they are also still resenting that the Eisenhower administration helped ending Spain's isolation and gave the country international respectability for the first time since the end of the Civil War (examplified by the iconic hug between Franco and Eisenhower when the US president landed in Madrid for his historic visit, the first one by a mejor head of state since the end of the conflict). Oddly, the US-Spanish treaty of 1952 started the economic development that trickled down towards a gradual social and political modernization, which ultimately lead to a successful democratic transition after Franco's death. I'm saying it's odd because the same people who where protesting regime change in Iraq by the US because "you can't bring democracy with guns, but with engagement and pressure" are also complaining that the US engaged and pressured (as much as it was reasonable during the Cold War, of course) the Spanish dictatorship toward relaxing its authoritarian rule. … I wonder how someone against regime change via war can also be against peaceful regime change (engagement, pressure plus a targeted decapitation, perhaps). Maybe it's just the Revel rule: "reproaching the United States for some shortcoming, and then for its opposite ... a convincing sign that we are in the presence not of rational analysis, but of obsession." ... and the French try to roll with punches. ... et les franchouilles encaissent. He was a false hawk. Powell: I'm going to go now. Hey, I'm talking to you. Bush: Sshhh! I'm praying. The United States will never again run the gauntlet for the United Nazions. Les Etats-unis ne passeront plus jamais sous les Fourches Caudines de l'ONUzi. Mais… c'est injuste ! You Do Not Understand! La France, elle, Is Acting in Good Faith! If only you read the French press (as well as some of the comments of certain people on this website) and watched French TV, you would understand that — whereas the Americans are ever and always guilty of blockheadedness, simplicity, greed, and/or treachery — it always turns out that, in the last resort, the French, eux, are acting in good faith; there are always rational reasons explaining their largest error; and for anyone — anyone — to put this into doubt can only be labelled grossly unfair. America invades Iraq without UN approval and America is portrayed as a barbarian striding across the world stage. Recently, France essentially invaded the Ivory Coast to protect its interests there ... without asking the UN squat. Just pointing out the hypocrisy. Europe offers a … paradox. Our Western cousins have chosen a path far different from our own, on almost every social, economic, and military issue. Throughout this war Europeans have snickered that over-the-top Americans blast their way across the globe, leaving needless wreckage in their wake, in their Team America-like search for mythical jihadists. But ask the Dutch, who, as thanks for crafting the most liberal society in Europe, are now living in fear of a jihadist assassination campaign. Or talk to the Spanish — whose appeasement after the Madrid bombing earned them an Islamist plot to obliterate their Supreme Court judges. France — in its old blow-up-Greenpeace mood — claims that it only supports the use of force in extremis, but then almost immediately exploded the tiny air force of the Ivory Coast on news that nine of its soldiers were killed, prompting thousands of Africans to hit the streets in anti-Gallic rage. George Bush thus will get no credit for elections replacing the Taliban or for the liberation of women in Afghanistan, much less for democracy in Iraq. Instead he will be the target of constant venom for the human costs of war, with the silent proviso that he is not to cease, lest a Holland, France, or Spain become even more besieged by anti-Western jihadists emboldened by American appeasement. Indeed, Bush must endure elite European hatred, even as the majority there silently expects the United States to maintain the alliance and protect the West. Quick: What Western power bypassed the U.N. recently, ignored the international community and launched a pre-emptive attack against the forces of a sovereign foreign government? Why . . . France, of course. … The irony in the strike by the French, who criticized President Bush's war against a real threat in Iraq, is, of course, hilarious. France did what it wanted (but don't expect U.N. Secretary-General Kofi Annan to call it "illegal"). The French are now doing EVERYTHING they accused the United States of prior to and during the war with Iraq! Aucun sang pour le chocolat! Canada has become a nation crippled by a dishonest pacifism. Rather than announce we're wimps, we pretend in the councils of the powerful that we'll send our soldiers to fight ... but only if the stars are aligned just so. We'll send "peacekeepers," an abominable word that denies the reality that it is only the application of brute and vicious force in the disordered and deadly precincts of the world that can ensure peace. …that's the quiet way Bush operates. He greatly appreciates such loyal allies as [José Maria] Aznar or British PM Tony Blair or Australian PM John Howard. He doesn't shout it from the rooftops, but he also doesn't appreciate such fair-weather Canadian "friends" as [Jean] Chretien and [Paul] Martin. The only thing that will heal that situation is time — and real supporting action by Canada. What does that tell you about condescending "peace camp" members putting the onus on Dubya and haughtily asking him (demanding of him, really) that he resort to action to heal the rifts of the past? It matters little that Kerry had explanations for all of [his] positions, and that he seemed to address them satisfactorily in his three debates against Bush. What mattered ultimately was that he needed to explain them at all. And this gets down to the real difference between the two men in this race—George W. Bush was Andrew Jackson; John Kerry was Woodrow Wilson. Jacksons try to tailor their message to the desires and fears of the average person. Wilsons tell the average people that their desires and fears are irrational, and try to convince them that they should want something else. Jacksons lay out their agenda clearly, in simple black-and-white terms. Wilsons tell people how complicated the world is, suggesting that public affairs is therefore best left in the hands of an educated elite. Jacksons act decisively in defending what they see as the national interest. Wilsons fret about the "international community." Chiraq is on the rag when it comes to the States. Now he can get all that 'girl talk' out of his system with Condi. Dès qu'il s'agit des States, Chirak a ses ragnanas. Maintenant il peut discuter tant qu'il voudrait 'entre filles' avec Condi. French consider naming streets after Arafat. Les franchouilles étudient la possibilité de nommer des rues d'après Arafat. The Iraq Crisis Is All America's Fault!